This is far more apologizing and contrition than the world average. So why has Japan gained so little recognition for these actions? One reason, noted previously, is that its Axis partner, Germany, has performed better on the atonement front. But this is not the only factor. Another one is international politics. Strategic imperatives dictated that Israel, Western Europe and, after the Cold War, Central European states better their ties with the Federal Republic of Germany. In Asia, however, Japan’s position has deteriorated. In the 1970s and 1980s, the Chinese Communist Party (CCP), not wasting much time on the past, wanted Tokyo’s money, which it got in vast amounts. Today, Beijing no longer needs the cash. Japan’s ally, the U.S., has replaced the Soviets as the enemy. Moreover, the CCP now fosters Japanophobia to bolster its chauvinistic credentials. South Korea was a poor autocracy when it normalized relations with Japan in 1965. It received Japanese economic assistance as part of the treaty, but Seoul indemnified Japan against claims related to the colonial era. Since democratization in the late 1980s, many Korean leaders have worked hard to better relations with Japan. However, there are also electoral incentives to play the “anti-Japan card.” Being labeled “soft on Japan” is a curse. This is particularly true for President Park Geun-hye, whose father, the late general-president, began his rise as a lieutenant in the Army of Japanese Manchukuo (a patriotic choice, but one that carries an image problem today). Economic success has freed South Korea from foreign assistance. Its judiciary is also now independent. Recently, the Supreme Court ruled that the 1965 treaty with Japan violated the constitutional right of Koreans to seek redress against Japan. Japanese diplomacy has failed to adapt to this new era in Korean politics. Finally, several Japanese leaders have eviscerated past apologies. Prime Minister Shinzo Abe dispatches offerings to the Yasukuni Shrine, whose message is aggressively antagonistic to the Kono and Murayama views. Pilgrims at Yasukuni since Abe returned to power have included Deputy Prime Minister Taro Aso and Senior Vice Foreign Minister Nobuo Kishi, brother to the prime minister. 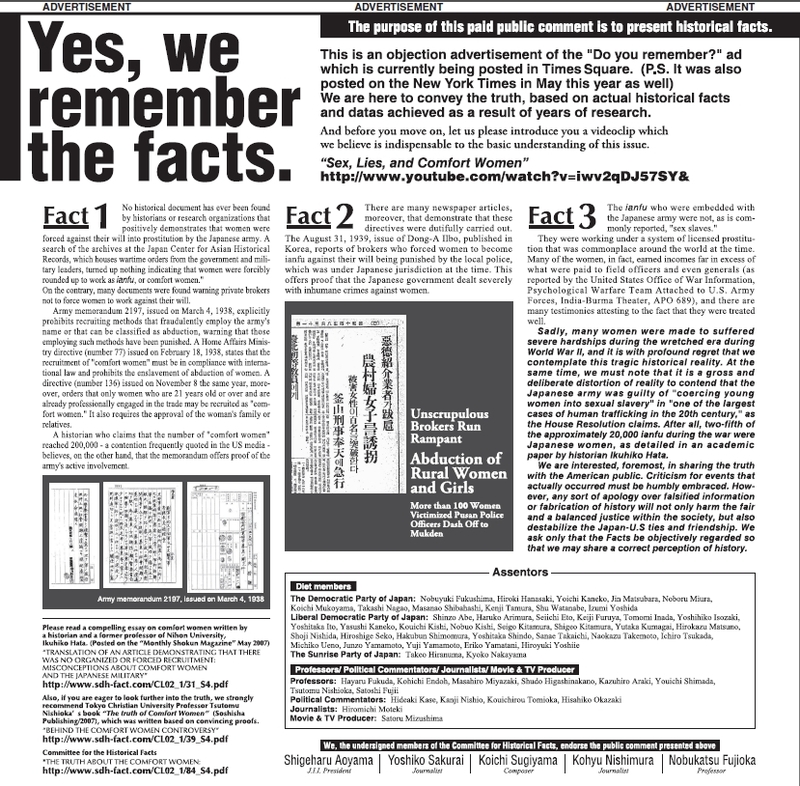 On November 4, 2012, a number of Japanese public figures ran an ad in a U.S. newspaper. It denied that the military coerced comfort women, going against the letter and spirit of Japanese official policy. Among the “assentors” listed are Shinzo Abe, who was about to return as premier, and other politicians. The text provides links to “The Nanking Hoax” and similar articles. Abe now officially accepts the Kono and Murayama statements, but his unconcealed love of Yasukuni, the behavior of those he has appointed to high office, and his indirect affiliation with “deniers” ensures that most foreigners and Japanese think he leads a cabinet of “revisionists. Koreans also noted reports that Japanese diplomats complained to a New Jersey town about a memorial to the “comfort women.” (The Japanese side was unwilling to discuss the matter, so the facts remain unclear.) This occurred under the DPJ administration of Prime Minister Yoshihiko Noda, showing that the LDP is not the only source of hostility to the Murayama-Kono statements. Additionally, Japan claims ownership of the Korean-controlled Liancourt Rocks (Dokdo in Korean, Takeshima in Japanese). This elicits anger in Korea. The posting of Japanese government videos on Japan’s right to Takeshima helps convince South Koreans that Japan is its foe. 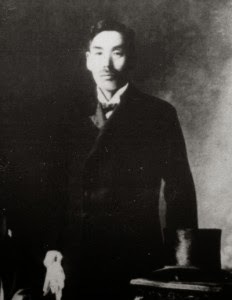 Another recent episode, which is minor but illustrative, concerns Ahn Jung-guen, the Korean assassin of the Japanese Resident General in Korea in 1909. Referring to plans to erect an Ahn statue in China, Chief Cabinet Secretary Yoshihide Suga called him a “criminal.” One of my alma maters, Yale University, boasts a sculpture of Nathan Hale, a colonial subject and activist who, like Ahn, was hanged by the authorities of the day. But one would not imagine Her Britannic Majesty’s government taking offense. Former colonies routinely honor those who fought the occupiers, often in barbaric ways. Interestingly, in 1964, Prime Minister Eisaku Sato (Abe’s grand-uncle) awarded the Grand Cordon of the Rising Sun to the American General Curtis LeMay, whose B-29s incinerated Japanese cities during the war. Koreans might be surprised to learn that Ahn, who like the American aviator considered he was waging a just war on Japan, is a “criminal” but that LeMay belongs to a select group of foreigners granted prestigious decorations (he was thanked for his work with the Japanese Air Self-Defense Forces, but it is unlikely premier Sato was unaware of that LeMay’s men killed around 100,000 civilians in Tokyo alone). The Ahn statue in China rightly worries Tokyo, which it sees as a sign of a Sino-Korean bloc against Japan. But the more Japan fails to see how Koreans view the past, the more Koreans will dislike Japan. Reaping dividends from the Kono and Murayama Statements, apologies, and compensation, was always going to be hard. Japan’s current cabinet, and some of its predecessors, have done everything they can to minimize the payout. Robert Dujarric is director of the Institute of Contemporary Asian Studies at Temple University Japan.